Sodexo Dining Services has partnered with Rhode Island’s first full-service food scrap collection and commercial compost operation to save all food waste generated in the campus cafeteria for processing into high-quality compost for Rhode Island growers. Twice a week, The Compost Plant employees, sometimes the founders themselves – Nat Harris and Leo Pollock – will arrive on campus to empty the color-coordinated 48-gallon totes that are filled with food scraps by Salve/Sodexo employees. Once collected, the food scraps will be delivered to Earth Care Farm in Charlestown, where they are processed into high-quality compost and delivered to the state’s farms and gardens. The Compost Plant also collects from restaurants, caterers, commercial food wholesalers and distributors, industrial food manufacturers and processors, supermarkets, resorts, conference centers, banquet halls, religious institutions, military installations, prisons, corporations, hospitals and casinos. “To date we’ve offset 78 million pounds of carbon-dioxide from the atmosphere,” Harris says. “Like waste vegetable oil, I see food waste as another waste energy stream that’s not being utilized in Rhode Island. 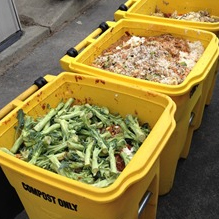 We can use this food waste to create compost, keep it out of the landfill. This compost will displace the use of petroleum-based fertilizers.” Salve/Sodexo already collects used cooking oil on campus for donation to Newport Biodiesel for conversion into sustainable heating fuel. Among the other sustainability initiatives in place by dining services, Salve/Sodexo maintains a campus garden together with Salve Regina students, it operates Ecolab’s Apex dishwashing system to save water and energy, Sodexo chefs design menus to use as many local ingredients as possible and the cafeteria uses XPressnap dispensers to save 30 percent over traditional napkin dispensing mechanisms. “We could never compost the volume of food waste on campus,” said Mark Roderigues, Sodexo Campus Services general manager. ”Partnering with The Compost Plant has given us the ability to turn our food scraps into compost for Rhode Island farms. It’s a definite win-win!” For a roundup of Sodexo Dining Services sustainability initiatives at Salve Regina: https://salveregina.sodexomyway.com/explore/sustainability For a roundup of university-wide sustainability initiatives: http://www.salve.edu/about/sustainability.